As you can see below, we have a more extensive menu selection, that would be too difficult to price in general. Please look through the menu for the items you are interested in and pick numbers of each item from the form below. Then fill in the sections for your name and the address of the event and any other relevant information, the information will be e-mailed to us and we will price your quote and contact you by your preferred method, (E-mail or Phone). If you do not see what you are interested in on the menu, please fill in the Request box with details of the menu you would like. Describe your personal requests here. 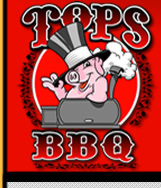 TOPS BBQ will reserve a date and time with a 25% deposit (non-refundable). You may reschedule within 72-hours without additional fee, providing the new date & time is available. Two weeks prior to your event, 50% of the balance is due. The final balance is due the day of the event. We do not add a gratuity charge. We feel it is our client's choice to reward quality service as they choose.